When the X_TRADER workstation connects to remote Gateways over a standard Internet connection (also called a Remote Client/Remote Host configuration), you must configure the IP Address and port of the Remote Proxy Daemon. Additionally, you can enter a second Remote Proxy Daemon IP Address that will act as a backup in case a connection cannot be made to the primary Remote Host. 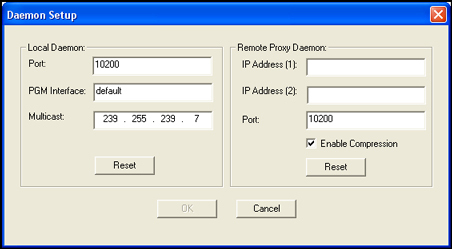 In the Remote Proxy Daemon section, in the IP Address (1) field, enter the appropriate IP address. In the IP Address (2) field, enter the appropriate IP address. This serves as your failover connection. Note: The IP Address (1) and IP Address (2) fields also allow for DNS names.